The Model 7716 Bench-Top Consistometer enables mobile and remote cement testing laboratories with very limited space to perform the fundamentally necessary testing of cement thickening time. This instrument is capable of testing cement thickening behavior in accordance with most API Spec 10A testing schedules. the Model 7716. This small, rugged instrument employs many of the design features of our full-sized consistometers in order to provide years of reliable service. The Model 7716 Bench-Top Consistometer is simple to operate with all of the operational controls conveniently located on the front panel alongside visible indications of thickening time, pressure and temperature. The slurry cup is designed so that closure, heating and pressurization can be achieved quickly. recorder tracks the temperature and cement consistency. Once the user-set consistency is reached, an alarm will sound to alert the operator when the test is completed. The automatic shutdown feature of the instrument will turn off the motor, heater and timer as well as turn on the cooling water. Operation can be further simplified by addition of the optional Model 5270 Data Acquisition and Control System which consists of interface electronics and custom software. To maximize system reliability, the software is purposefully designed to run on a stand-alone computer. The Model 5720 software can acquire test data as well as upload test protocols to multiple compatible Chandler Engineering instruments. 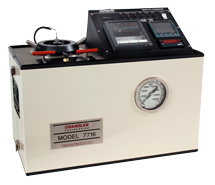 The usefulness of the Model 7716 Consistometer is not limited to the testing of cement thickening time. It can also be used to prepare slurries for other tests such as measuring free water content, testing for fluid loss or rheological properties and viscosity.